Planète Chocolat introduces an assortment of exceptional macarons with a chic new presentation. Safe and sound in their luxury box, each macaron is individually made from fresh and natural ingredients that have been carefully selected. 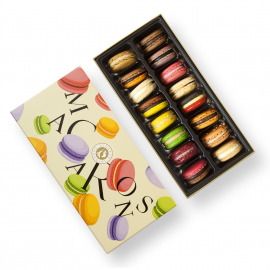 Light yet generous, these intensely flavored macarons contain little sugar and are rich in almonds. Their fillings are crafted from fresh fruits and high-quality chocolate made with our know-how. Enrobed in two fine, crispy shells, each mouthful will renew with every flavor the pleasures of taste.